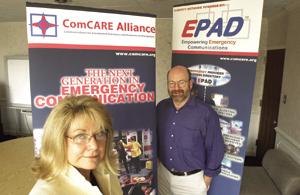 Judith Woodhall and David Aylward of the ComCARE Alliance are working on the Emergency Provider Access Directory, which would give public safety agencies a Web registry with information about their counterparts throughout the nation. Public Technologies Inc.'s Robert Hicks said if the Emergency Provider Access Directory is to succeed, it must help local governments with day-to-day emergency response needs, not just focus on emergency response for major disasters. A coalition of public safety and health organizations is sponsoring a program to create an electronic directory of the nation's first responders and emergency personnel. The initiative, known as the Emergency Provider Access Directory, would give the nation's 80,000 public safety agencies a map-enabled, Web registry containing telephone numbers, Internet addresses and street addresses of their counterparts throughout the United States. The registry could save time, for example, if a hazardous-materials truck were hijacked. Local law enforcement officials could notify police, fire, transportation and health officials along the route where the truck was headed so they could prepare to intercept it or react to a chemical spill. The directory is the brainchild of the Washington-based ComCARE Alliance, a non-profit coalition of more than 90 organizations representing services from public safety and health officials to first responders and automotive and wireless technology companies. When fully deployed, the directory would serve as a key component of an electronic safety network, an integrated emergency communications and information system that the alliance envisions for the country. "We need a 411 for 911," said David Aylward, ComCARE's director. More than 80 representatives from a wide range of technology companies attended a pre-request for proposals technical briefing for the project May 24 in Washington. The briefing attracted small, leading-edge companies with Web services and directory access protocol solutions that have an interest in bidding on at least one aspect of the project, and large companies that wanted to learn more about the directory because they might incorporate it into their public safety offerings. Among the systems integrators at the event were BearingPoint Inc., Computer Sciences Corp., General Dynamics Corp., Harris Corp., Lockheed Martin Corp., Northrop Grumman Corp. and Unisys Corp. The alliance, which received a $1.7 million grant from the Justice Department's Office of Justice Programs in fall 2003, estimates that a national rollout of the directory would cost between $15 million and $25 million. Although the alliance has sufficient funds to produce a live test version of the product in a region of the country, it lacks the funds necessary for national deployment, said Judith Woodhall, the project's managing director. Aylward said additional money likely would come from a mix of federal and state funding and private sources. The Justice Department grant is sufficient to allow the alliance to develop a business model and project architecture, said Holli Ploog, vice president and general managing partner of global public-sector programs with Unisys of Blue Bell. Pa.
Establishing those aspects of the project "may be enticing enough to allow them to solicit funds from other entities," she said. Although some providers of emergency services have local or regional directory systems, most do not have accurate information about their counterparts within the same region. The project sponsors maintain that there is no national service of this type available. "Each of these agencies is recognizing the need not just to make phone calls and faxes, but to share data among headquarters operations," Aylward said. "They are coming up against the absence of a GIS-based directory." When an agency or jurisdiction registers with the directory, it would be able to choose the information it wants to receive, how the information should be delivered and who should get it. Having the non-profit alliance develop the system means it can bring together both the public safety users and the private-sector providers of public safety solutions to agree on the system's requirements before it is developed and marketed, said Ron Miner, southeast business development manager for commercial, state and local business for Northrop Grumman Information Technology of Herndon, Va. Miner said a lot of public safety agencies prefer to have something developed by an independent third party without a vested financial interest. "This is something that a lot of agencies look for. They don't want something that is from just one company," he said. Once the product is developed and made available nationally, systems integrators could incorporate it into a public safety product or solution. "This is an excellent opportunity to further integration offerings that we already provide to the public safety community," Miner said. The alliance staff and public safety experts agree that the project has a long way to go before it can become a national project. For it to succeed, the alliance needs enough funding for a national rollout and to overcome resistance from jurisdictions already using similar products, they said. Unisys is tracking the initiative to learn how its solutions would work with the product and whether it might include the product in its public safety offerings, Ploog said. The company might even bid on the project as systems integrator, she said. [IMGCAP(2)]One of industry's chief concerns is whether the jurisdictions will have sufficient funds to participate in the project. Because of this, the alliance has decided not to charge a subscription fee to jurisdictions or individual agencies interested in participating, Woodhall said. "We probably would not charge the initial first responders," Woodhall said. Robert Hicks, transportation and public safety program director for Public Technologies Inc., a Washington non-profit technology research and development organization, also questioned whether public safety agencies at the state and local level will want to take part when they may have a closed directory and are able to receive law enforcement and justice-related information through the National Law Enforcement Telecommunications System. This is a computerized message switching system that allows federal, state and local law enforcement and justice agencies to exchange information with each other. As if those challenges aren't enough, the project may face significant technical obstacles working with existing systems. For example, most of the computer-aided dispatch systems in use at the local level don't use the open architecture and Extensible Markup Language standards on which the directory would be based, he said. If it is to succeed in the long run, the project must help local governments with day-to-day emergency response needs and not just focus on emergency response for major disasters, Hicks said. The project would need to evolve into a system that could provide information that local jurisdictions need as to the nature of an emergency incident, where it is and who is involved in responding, he said. The project has to be based "on what states and counties do every day," Hicks said. "It has to be a lot more than just a directory."